FILE - Women carrying children in their arms stand up to protest Homeland Security Secretary Kirstjen Nielsen, left, during Nielsen's opening remarks before Senate Appropriations subcommittee hearing on Capitol Hill in Washington, May 8, 2018. Kirstjen Nielsen, who has headed the agency since December, came under attack by Democratic senators days after Attorney General Jeff Sessions said a "zero tolerance'' policy toward people entering the country illegally could lead to more families being split up while parents are prosecuted. "They will be separated from their parent,'' said Harris, who's considered a possible contender for her party's 2020 presidential nomination. 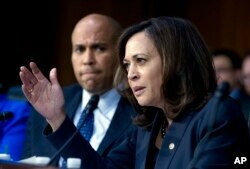 Sen. Kamala Harris D-Calif., accompanied by Sen. Cory Booker D-N.J., questions Homeland Security Secretary Kirstjen Nielsen during a hearing, Jan. 16, 2018, in Washington. 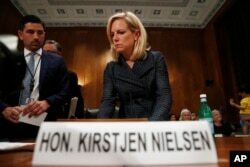 "Just like we do in the United States every day,'' Nielsen replied. "I could not agree with your concerns more, period,'' Nielsen said. "It is our duty to protect them, to keep them in a safe environment,'' Nielsen said.